Be the first to share your favorite memory, photo or story of Miriam . This memorial page is dedicated for family, friends and future generations to celebrate the life of their loved one. 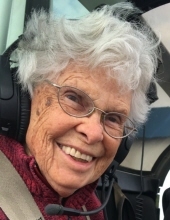 GABLE – Miriam Elizabeth Clark Reed, 90, wife of Dr. Gordon Kenworthy Reed, died Friday, March 22, 2019, at Prisma Health Tuomey Hospital. Born February 25, 1929, in Syracuse, New York, she was a daughter of the late Robert Newton Clark and the late Ruth Mahood Clark. She was a member of Sardinia Presbyterian Church. She is survived by her husband of Gable; two sons, Robert Theodore Reed and John Kenworthy Reed (Diana), both of Birmingham, Alabama; three daughters, Elizabeth Lee McNutt (Clark) of Birmingham, Alabama, Nancy Zoeller (Fred) of Everett, Washington and Virginia Ann Akin (Mark) of Pell City, Alabama; thirteen grandchildren; and twelve great grandchildren. In addition to her parents, she was preceded in death by a granddaughter, Meaghan Elizabeth McNutt; a daughter-in-law, Nancy Reed; and two sisters, Nancy and Roberta. A funeral service will be held at 3 p.m. on Monday, March 25, 2019, at New Harmony Presbyterian Church with the Rev. Dan King and the Rev. Patrick Womack officiating. Burial will follow in Sardinia-Gable Cemetery. Honorary pallbearers will be Women in the Church (WIC) of all the churches that she and her husband served. Visitation will be held from 1:30 to 3 p.m. prior to the service at New Harmony Presbyterian Church and other times at the residence, 12873 Highway 301, Gable. In lieu of flowers, memorials may be made to Reasonable Hope Ministries, P.O. Box 26, Gable, SC 29051 or to Clarendon Christian Learning Center (CCLC), P.O. Box 911, Manning, SC 29102 or to Trinity Center for World Missions, www.trinitycwm.org or a Christian organization of your choice. To send flowers or a remembrance gift to the family of Miriam Clark Reed, please visit our Tribute Store. And other times at the residence, 12873 Highway 301, Gable. "Email Address" would like to share the life celebration of Miriam Clark Reed. Click on the "link" to go to share a favorite memory or leave a condolence message for the family.